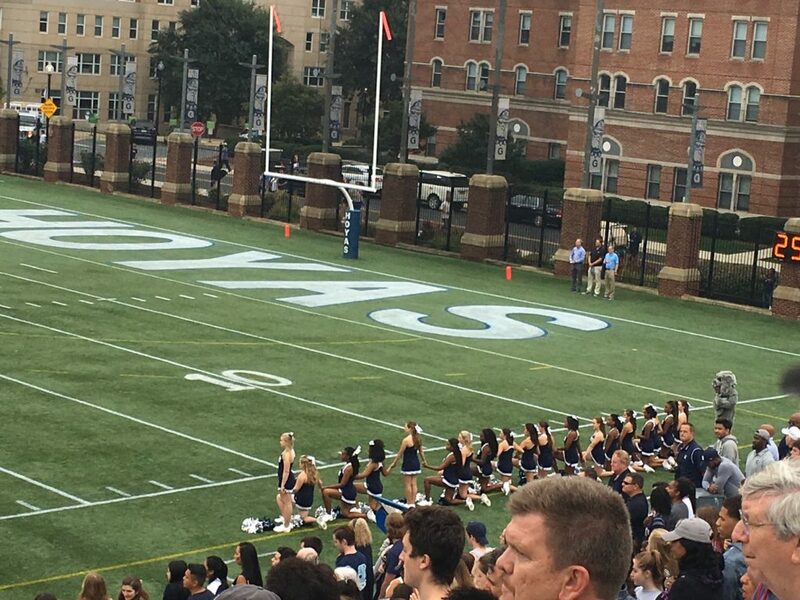 Last Saturday, in the middle of Homecoming weekend, the Georgetown University football and cheerleading teams lined up on the sideline of Cooper Field for the national anthem, played before the start of every football game. This game, however, 11 of the 85 active football players and 17 of the 19 varsity cheerleaders did not stand. They knelt. The athletes’ decision to kneel during the national anthem is a political statement, a continuation of an ongoing national protest which originated in the NFL when San Francisco 49ers quarterback Colin Kaepernick sat down for the national anthem during a preseason game on Aug. 26. For Kaepernick, and the numerous NFL, NCAA, high school, and other athletes who have followed suit, the decision to sit (and later kneel after Kaepernick decided it was a more respectful form of protest) is an objection to the racial inequality and police brutality that the American flag represents to many members of the African-American community. This is precisely why 11 Georgetown football players and 17 Georgetown cheerleaders chose to kneel. They have since spoken out about this decision. This Editorial Board supports the legitimacy of this manner of protest and recognizes the seriousness of the grievances that these Georgetown student-athletes have chosen to highlight. We are deeply saddened by the continued injustice many African-Americans face, as evidenced by the recent police shootings of two black men, Terence Crutcher in Tulsa, Okla. and Keith Lamont Scott in Charlotte, N.C., in addition to countless other unnecessary and tragic shootings. We also strongly believe that the conversation the Georgetown football and cheerleading teams have brought to our campus is a crucial one. It deals not only with racial oppression, but also touches on the intersection of freedom of speech and patriotism. While most acknowledge that freedom of speech grants athletes the right to speak out, there has been elevated media controversy surrounding the decision of many, principally Colin Kaepernick, to not stand and honor the American flag. Critics feel that it is disrespectful and unpatriotic to sit or kneel during the national anthem, which many view as a symbol of the freedoms for which many brave service men and women have given their lives. While this Editorial Board certainly acknowledges and deeply appreciates the sacrifices of our current military service members and veterans, we also view the attempt to raise awareness of racial injustice as another form of patriotism. These professional and student-athletes love their country, and it is out of this love of country that they strive to promote awareness and change. The controversy surrounding the manner in which these athletes protest does a disservice to their advocacy. For every minute of airtime and every article devoted to exploring whether these athletes should be protesting in some other way, media outlets are taking away valuable time that can be used to discuss the true focus of the protest, which is the issue of racial oppression, specifically police shootings of unarmed African-Americans, and how to solve it. Student activism is an essential part of fostering growth and improvement on a college campus, and the Hilltop is no exception. Our campus has benefitted from the awareness that student activism, especially from student athletes, can bring. 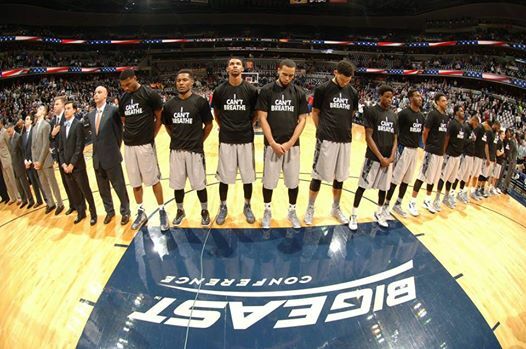 The Georgetown men’s basketball team’s decision in 2014 to wear “I Can’t Breathe” warmup shirts helped to spark an important dialogue about the death of Eric Garner and racial oppression. 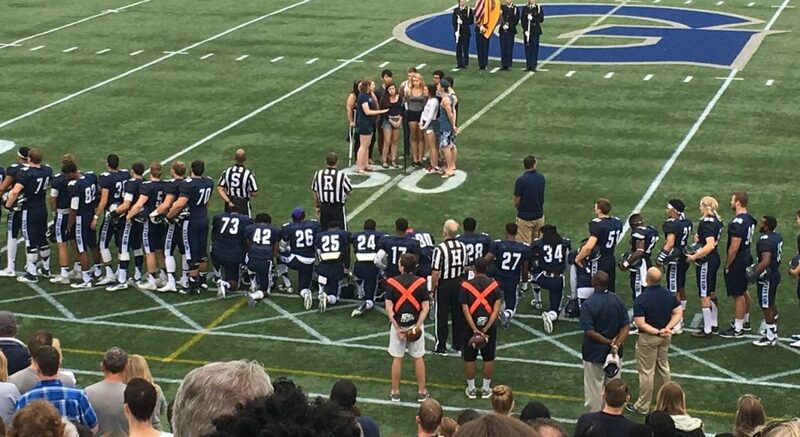 The decision of 28 Hoyas to kneel during the national anthem has reignited that conversation, and this Editorial Board is hopeful that it will produce meaningful solutions to racial injustice on campus at Georgetown, in the Washington, D.C. area, and in the United States as a whole.